This tour is also available as a longer 23-days trip. Click here for detailed information! Phantastic and untouched Landscapes covered by tropical forest and a matchless density of ethnic minorites are the key features of the region known as the “Golden Triangle” which covers parts of southern China, northern Laos and Thailand and is connected by the Mekong. Our route will lead you from Jinghong in South Yunnan through a natural reserve in Luang Namtha to beautiful Luang Prabang, Lao’s ancient imperial capital. Individual journey to Kunming, joint onward flight to Jinghong. After arriving in the hotel we go on a first stroll through the alleys around our hotel and have a welcome dinner in one of the local restaurants. Jinghong, the capital of the Dai Autonomous Prefecture Xishuangbanna, functions as China's gate to South-East Asia. For the Dai (Thai) people, once powerful rulers over South Western China, this prefecture is the last enclave within the PRC. In the morning, we prepare our bicycles and set out for a first little day trip around the city, passing Dai style Buddhist temples and paddy fields on our way. The first stage of our tour takes us to Ganlanba, a Dai (Thai) village at the Mekong known for its well preserved traditional wood houses and temples. In the evening we have a Dai style dinner in one of the village's typical pile dwellings. We cycle through pineapple fields and banana plantations and reach Menglun around noon. In the afternoon we have time to explore the city's impressive botanical garden which boasts over 3.000 types of tropical plants and flowers. On today's challenging stage, we pass through villages of the Dai, Hani and Ailao and cross three mountain passes to reach Mengla. Stunning views over Xishuangbanna's tropical forests and hills will be the deserved reward for our climbs. We ride leisurely through scenic tea plantations and reach the Chinese-Laotian border at Mohan in the early afternoon. The booming border town features a lively mixture of Chinese, Lao, Thai, Burmese and hilltribe people who come here to trade their produce. It is time to say good-bye to China and hello to Laos! We cross the border in the morning and cycle through nice hilly terrain to Luang Namtha which lies beautifully in a mountain plateau, surrounded by paddy fields. In the afternoon, we have time to relax and and have a first cup of Café Lao. Two nights stay in a Bungalow resort. Today, you can either have a day of rest or join us on a little ride on the fertile plateau. We can have a look at the local silk weaving production in one of the villages near Luang Namtha. The destination of today's stage is Oudomxai. We will notice many Chinese traders and merchants who have settled here and have given this place a distinct Chinese flair. After one climb in the morning, we follow the gentle course of river Phak until it merges into River Ou at Muang Khua. We stay one night in a simple hotel. On a small boat the driver naivigates us through the currents of picturesque Nam Ou. We arrive in peaceful Muang Ngoi in the afternoon. In this village which can only be reached by boat we stay one night in bungalows. In the morning drive one hour by boat to Nong Kiaw. 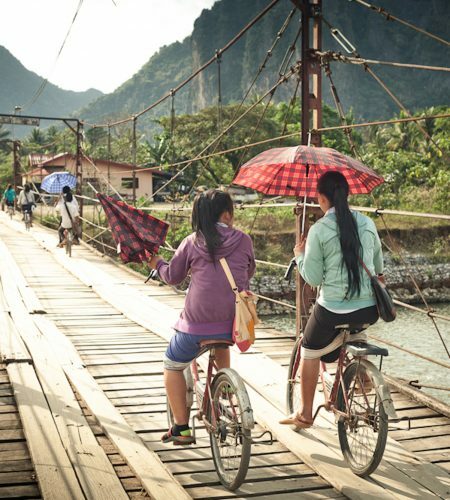 Back on our bicycles, we ride on rolling terrain to Pak Nam Nga, where we stay one night as guests of a Lao family. Together we explore the main attractions of the former imperal city. We visit magnificent buddhist temples and the former king palace. In the evening we stroll over the city's famous night market and enjoy the Laotian cuisine in a restaurant at the bank of the Mekong. On morning of your last day in Laos you will once more have free time to relax and take it easy. You can enjoy some cake and coffee in one of the city's pretty cafés, go shopping for souvenirs or explore a few more of Luang Prabang's numerous temples and atmospheric little streets. From Luang Prabang's small airport you will start your home journey in the afternoon. Arrival at your home destination.